Instagram users can now invite their friends watching their live feed into their stream. The feature is available with the version 20 of Instagram for Android and iOS. Instagram has announced a new feature for its Android and iOS app, which allows users bring friends into their live videos. To use the feature, users need to tap the “New” icon on the bottom right of their screen and then tap “Add” to invite anyone who’s currently watching their live stream. Once the other user joins, the video stream is split into two and the new user is displayed on the divided screen below. Users have the option of removing the added guest at any point during their live video stream and adding anyone else. The user joining the live stream can also leave whenever they want. 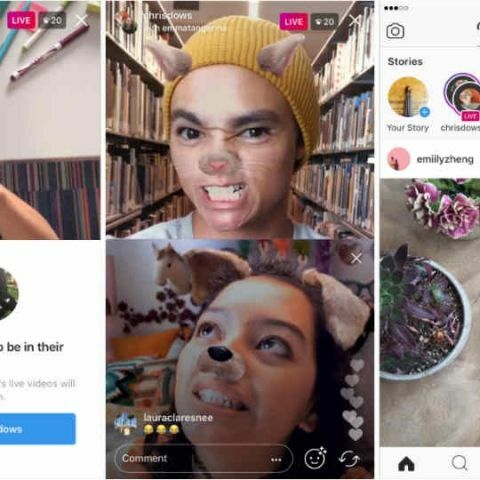 After the stream has ended, users can either choose to share their live video to stories or discard it. The Instagram app now shows two circles stacked together in the Stories bar whenever any friend goes live with a guest. Users can tap on it to watch it and comment, similar to other regular videos. The new feature is being rolled out in Instagram version 20 for Android and iOS. The company had also recently announced that users can now add both landscape and portrait photos to their multi-photo posts. Previously, users could only post square aspect ratio images. However, users will need to choose between creating either a landscape album or a portrait album. The number of photos per album is still limited to 10.